Limestone's wide array of shades, colours, textures and durability make this product the best loved stone, as it works equally well in both traditional and modern interiors. The sheer choice of honed, polished, aged, brushed and tumbled limestone that can be placed on the wall or floor has added ever-expanding appeal to this delightful product. The chief characteristic of slate and silt stones is the ability to split easy along parallel cleavage plains providing a texture that complements building material such as brick and wood. The striations and colourful hues of this inexpensive stone make it an ideal flooring material. The use of slate in contemporary interiors is becoming more popular, with the added bonus of being hardwearing. 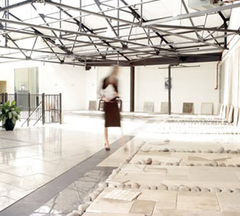 Stonell has introduced greater variations of Travertine. We buy filled and unfilled stone, each creating a different feel, with unfilled creating an 'aged' look soon after initial use. Due to the way Travertine was created millions of years ago, some small holes lying beneath the surface may appear during the first few months of wear. These are easily filled, giving decades of hard wear, as proven all over the world. Marble is formed from calcium carbonate that has recrystallised through metamorphism due to heat and pressure. Therefore, marble's crystal structure allows a high polish to be applied, which accentuates the beautiful colours and veining for which it is famous. 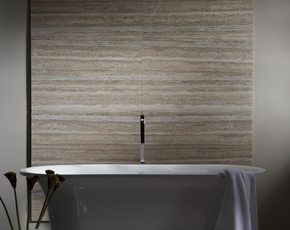 The stone is subtly aged by a tumbling action, removing the sharp edges and face to provide a stunning soft effect. Several years of searching has enabled us to supply beautiful tumbled stones and mosaics at fantastic prices. Quality of finish, good packing, perfect spacing, proper netting on the back and overall quality control are prerequisites to our purchasing and we pass all these benefits on to our customers. Granite and Basalt are both formed by volcanic activity and are amongst some of the hardest natural stones available to man. Granite was formed from molten magma deep below the earth's crust which has cooled slowly over millions of year and solidified. Basalt is a result of molten magma erupting from volcanoes and cooling quickly forming a solid mass filled with tiny air pockets. Although sandstone can be used internally, it is more suited to external applications, since it has a coarser, open grained texture. This makes it generally more abrasive than other stones and therefore appropriate for areas requiring greater slip resistance." Please note that as the products are natural the colour and thickness may vary. However, any thickness variations can be accounted for when laying the tiles on the adhesive bed. Size and thickness quoted are approximate. Due to the nature of the product some breakage during transport is inevitable despite our best efforts. When you order your stone allow an extra 10% for breakages and wastage when you calculate the quantity you require. If a few tiles are broken in transit they can always be used for edge. Unfortunately, we are unable to despatch goods until payment has been received in full.